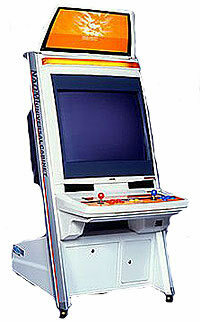 GigaWing 2, the sequel to the ill-conceived CPS2-based shooter. 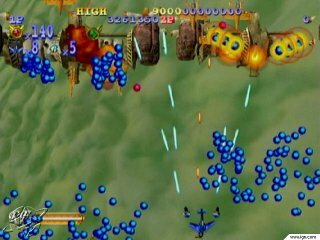 Those who’ve played the original GigaWing will surely remember the game’s almost maddening difficulty level and haphazardly designed challenges. These very players will probably distance themselves from the sequel due to its name alone, which is unfortunate–GigaWing 2 is considerably better than its predecessor in every conceivable way. The world is at war again, and it’s up to the GigaWing squadron to save humankind from itself. A greedy rebellion has risen against the established order, and they’re using innumerable ships and war machines to destroy the world. What’s more, rumors of a recently unearthed ancient artifact with massive destructive powers are starting to surface. As a valiant member of the GigaWing squadron, you’re to penetrate enemy territory, blow up every trace of their forces, and keep the ancient evil artifact from wreaking havoc on the world. Just like its predecessor, GigaWing 2 is a top-down shooter designed around a now well-established game mechanic: the reflect force. Reflect force is a weapon that rebounds the shots of your enemies right back at them. As the game lays on the enemy shots rather thickly throughout its stages, intelligent use of your reflect power is of paramount importance. Mars Matrix made heavy use of a version of this feature, and both GigaWing games are basically designed around it. Thankfully, GigaWing 2 pulls it off much more gracefully than its predecessor. At the game’s outset, you’re allowed to choose how you want your reflect force to behave–either as a standard repulsion field or as a lock-on laser beam. In either case, you can use it to deflect enemy shots. It’s what it does with those shots that varies. The repulsion field literally reflects enemy shots, while the reflect laser uses them to energize a powerful lock-on beam. Both types take a few seconds to refresh after use, but other than that, you’re free to use them at will. It’s tempting to say that the differences are mostly aesthetic, but they’re not–one is clearly offensive and the other is defensive, and to use either is to adhere to the appropriate strategy. 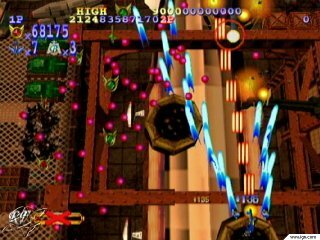 Aside from the reflect powers, ships are equipped with both standard shots, which increase in power as you grab power-ups, and screen-clearing smart bombs, which are accompanied by gratuitous (yet impressive) special effects.